Some twenty years ago word got out that endoscopic - mainly hysteroscopic at that time - procedures were performed at the deparment of Obstetrics and Gynaecology of the Jan Palfijn General Hospital in Merksem, Antwerp, Belgium (head Dr. Hugo van Herendael). As applications started to come in from all over the world, the director of the hospital, Jos Verschueren, allowed for foreign doctors to be trained in his hospital. He even offered accomodation within the hopital as he believed in these new techniques. Initially ,we offered one week courses where theoretical courses were given when there was no activity in theatre or in the outpatient department. We could offer very little hands on training in these circumstances. Because of the impact these courses had on the day to day running of the department the then head Mrs. Marie Therese De Vree suggested a change in formula. We opted for specialized courses on a specific topic on Friday and Saturday and for long term courses. Some trainees, enroled in the long term courses, stayed as long as two years, the average time of stay being six months. During these long term courses the trainees were now incorporated in the department and more time became available for both theoretical and practical teaching. Although they were supposed to produce a scientific article at the end of their stay, the trainees now had more time on their hands and the need to have a lab exclusively dedicated to handson training became evident. In the fall of 1992 an independent endoscopic lab of 90 square meters was created on the grounds of the Jan Palfijn General Hospital thanks to the financial input of K.Storz Gmbh & Co and the others sponsors of the initial phase. The organiser being Gyntech bvba. Theoretical courses could be given in the mini auditorium. In the larger room the set up allowed for hands-on teaching on animal tissues and operations could be performed on live anaesthetised animals. The video room allowed the trainees to review the tapes of theatre cases and allowed them to edit their own cases. From 1996 onwards, a strong collaboration was forged with the department of surgery ( Professor R. Van Hee) both for experimental and clinical work and for teaching. General surgeons, urologists, gastro intestinal surgeons, vascular surgeons and, last but not least gynaecological surgeons could be trained. 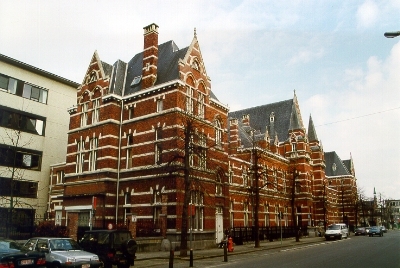 In the summer of 2003 the centre, now by the name Endoscopic Training Centre Antwerp (ETCA), moved to the facilities of the ACZA Campus Stuivenberg, the oldest hospital of the Antwerp City Hospitals (OCMW). Here the theatres have been renewed and equipped with audio-visual facilities to allow for more exposure to endoscopy for the trainees. The audio-visual facilities of the new auditorium "SANO" allow for a better interactive teaching. The hands-on lab has been set up in one of the century old basements, especially adapted to the needs. Due to massive immigration, from Europe, Africa, South America and Asia into Belgium, the OCMW became short of funds and had to reorganize its hospitals in a non-profit organization ZNA (Ziekenhuis Netwerk Antwerpen). The ACZA was renamed into ZNA STER (Stuivenberg-Sint Erasmus). This reorganization was effective as from January first 2004. The ETCA now operates out of ZNA Stuivenberg. The concilium of professors in Gynaecology Obstetrics of the Flemish part of Begium ( Flanders) has granted the privelege to the ETCA of teaching hysteroscopy to the registrars in Flanders. Each registrar has the opportunity to follow three courses during the time of his or her training.